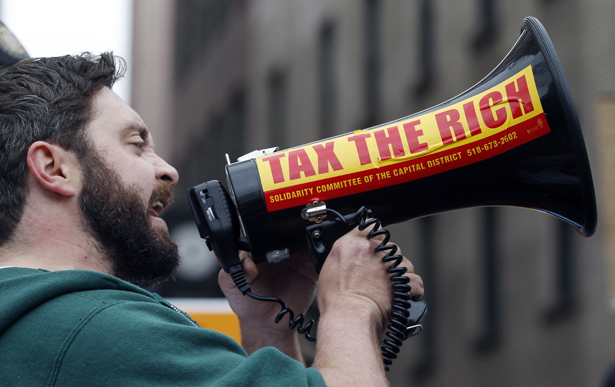 The decline of the progressive income tax and the rise of inequality. Whatever happened to the “progressive” income tax, the notion that taxpayers who make more money should pay taxes at a higher rate? Tax progressivity today has virtually disappeared. We have, in effect, a flat tax for our most financially favored. A taxpayer who pockets $45 million a year—or $450 million—pays federal income taxes at the same top rate as someone making $450,000. That’s not quite what our progressive forebears had in mind 100 years ago this month when they cheered ratification of the Sixteenth Amendment, finally giving Congress the power to impose a federal income tax. Progressives back then hoped the income tax would deal a body blow to plutocracy. But the first tax schedule, enacted soon after the amendment’s ratification in 1913, set the top rate at a mere 7 percent, not the 68 percent progressives in Congress had sought. World war would soon shift the tax terrain. In 1916, a Congress hungry for war “preparedness” revenue pushed the top rate to 15 percent. With that hike, one prominent House Democrat pronounced, tax rates had reached their “very highest notch.” Not for progressives: in 1917, social reformers ranging from newspaper publisher E.W. Scripps to labor leader Sidney Hillman redefined the tax debate with a national campaign that advocated “a conscription of wealth”—a 100 percent tax on income over $100,000. By war’s end, income tax rates would stretch all the way up to 77 percent. The post–World War I right-wing resurgence then turned the tax tables. Top rates would fall throughout the Roaring Twenties, down to 25 percent. Treasury Secretary Andrew Mellon, the Pittsburgh iron and steel tycoon, even engineered a $1.27 billion tax rebate for himself and his fellow deep pockets. The Great Depression and World War II would, in turn, reverse the Mellon tax cuts. First in 1932, and then repeatedly over the next decade, progressives defeated conservative attempts to raise needed revenues via a regressive national sales tax—and kept up the pressure for “soak the rich” rates. By 1942, President Franklin Roosevelt himself was calling for a 100 percent tax rate on income over $25,000 (about $350,000 today). Tax rates would top off at 94 percent during World War II and hover around 90 percent for the next two decades. High tax rates on high incomes, back in that early postwar era, struck even eminently respectable Americans as absolutely necessary to social stability and progress. Stiff tax rates served “to counteract undue concentration of wealth,” as Wall Street tax lawyer Randolph Paul, FDR’s point man on taxes during World War II, explained in 1947. “If the nation’s wealth flows into the hands of too few rather than into the hands of the many, the resulting amount of saving will be greater than can be absorbed. Our economy can take only so much of this sort of thing before it has a violent convulsion.” Republican President Dwight Eisenhower saw high taxes on high incomes as an antidote to the “opulence” that inexorably leads a nation to “depravity and ultimate destruction.” In the 1950s, under Ike, income over $400,000 faced a 91 percent federal rate. The Eisenhower-era rich, even after loopholes, felt a real tax bite. In 1955, the IRS took 51.2 percent of America’s top 400 incomes. And today, after thirty years of rising income inequality and shrinking tax progressivity? In 2007, America’s top 400 had an average tax bill, after loopholes, of just 16.6 percent. These 400 reported incomes averaged an astounding $345 million, more than twenty-five times (after adjusting for inflation) the $13 million that the top 400 took home in 1955. What went so terribly wrong? How could our tax progressivity have deteriorated so astonishingly? The conventional story line blames Ronald Reagan. But the dismantling of tax progressivity began about two decades earlier, under John Kennedy. “As they say on my own Cape Cod,” JFK famously assured America, “a rising tide lifts all the boats.” And nothing would cause the tide to rise faster, he contended in 1963, than tax cuts for everybody, the rich included. Steep tax rates, his economists told him, had become a “heavy drag” on growth, so his administration proposed reducing the top rate from 91 to 65 percent. Conservatives soon enough took Kennedy’s tax-cut case to the next logical level: If tax cuts could create the magical outcomes JFK promised, why stop at the 70 percent top rate Congress OK’d in 1964? Why, indeed? In the 1980s, Ronald Reagan cut the top rate first to 50 percent, then 28 percent, clearing the way for America’s plutocratic restoration. Where does all this leave us on income taxation’s 100th anniversary? Should progressives today simply recommit ourselves to restoring Ike-era tax rates? The reality we face suggests otherwise. Steeply graduated rates, as traditionally structured, haven’t been sustainable anywhere for more than a few decades. The super-rich have always been able to make them crumble. One reason: the 99 percent have never been able to rouse a passion on behalf of high top rates that matches the passion of the 1 percent—and the 0.1 percent—against them. The super-rich essentially take steeply graduated tax rates much more personally than the 99 percent. Given this historic dynamic, should we focus our tax attention elsewhere? Attractive options certainly do beckon. Instead of trying to raise top rates, we could concentrate on ending tax preferences for capital gains and dividends. We could go after overseas tax havens. We could press for financial transaction, wealth and carbon taxes. All of these options could make significant contributions to the struggle against inequality. All deserve pursuing. But we need not give up on steeply graduated tax rates; we need, instead, to find an approach that gives the 99 percent a greater incentive to defend them. Suppose, for instance, we set the entry threshold for a new 91 percent maximum rate as a multiple of our nation’s minimum wage—say, twenty-five times? That was the ratio between CEO and typical worker pay for much of the mid–twentieth century, before recent decades left top corporate pay averaging over 300 times workers’ take-home. The federal hourly minimum sits today at $7.25. A married couple working at minimum-wage jobs now annually earns just over $30,000. If we pegged entry into the top bracket at twenty-five times that, taxpayers making over $750,000 would face the 91 percent top rate. But if the minimum wage rose to $10 an hour, the top bracket wouldn’t kick in until just over $1 million. In today’s plutocratic America, the rich get richer by exploiting the poor. In an America that tied maximum tax rates to minimum wages, the rich would regularly “get richer”—that is, pay less in taxes—only if low-wage workers were taking home bigger paychecks. Happy 100th birthday, progressive income tax! There may be some life in you yet. Eric Alterman writes that the president’s inaugural address touched all the important bases, except one: the crisis of inequality that threatens not only our economic recovery but also our democracy.